The Mellowvision Aquatics Grow Panel is a multi-purpose tank insert that is the perfect start towards a beautiful aquarium, paludarium, turtle tank, or vivarium. Simply secure it to the back wall of any tank to create an instant planter or shoreline, or add your own custom rockwood, driftwood, cork, plants and even corals to create a unique living background. The planter pocket can be filled with a variety of subtrates, or you can add a piece of slate or wood to create a marginal retreat for turtles, crabs, and other amphibious creatures. 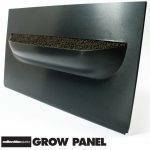 The Grow Panel is made from light, durable, expanded PVC foam board, which is waterproof, inert, and aquarium safe. We’ve seen the material in use for years in professional aquatic exhibits at locations such as the New York Aquarium, where it is installed in dozens of tanks. The soft, non reflective surface creates the perfect flat black backdrop to bring out the colors in flora and fauna, and it’s texture allows for mosses and coraline algae to easily cling and spread over the surface. Grow Panels are a great solution for many applications. Perfect for marginal plants in paludariums or open top aquariums. Quickly create a planted ledge or moss wall in your nano tank. Easily add a removable planted wall to your bare bottom breeding tank. Add a piece of slate or driftwood for an instant turtle dock. Mount air plants, mosses, and other plants in a tropical vivarium. Attach cork, stone and driftwood to create a removable custom background. We are currently offering Grow Panels with two different installation styles. The magnetic inserts allow you to install and remove the panel with ease. High strength magnets within the insert and on the outside of the tank keep the insert securely in place, but allow it to be easily removed for replanting or maintenance. The glue-in inserts can be attached with silicone or polyeurethane glue to form a permanent bond with the tank that should last for years. Simply run a bead of glue around the edge of the insert and around the inside of the planter pocket, and press into a clean, dry tank. It is recommended to wait 48 hours or more before adding water. 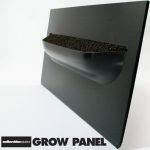 The Mellowvision Aquatics Grow Panels are available in a variety of sizes. More sizes and styles are on the way soon, but we are currently offering Grow Panel inserts for 20 gallon tall tanks and 11 gallon rimless tanks (also fits 10 gallon Aqueon). Grow Panels can be cut down to fit uncommon tank sizes. Custom sizes and colors are available, just shoot us an email to discuss your needs. 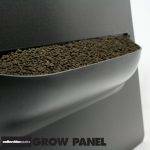 Download the Grow Panel installation instructions. Mellowvision Aquatics is dedicated to designing original, useful products for aquarium and vivarium hobbyists. 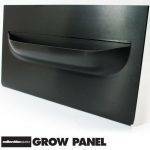 If you are interested in ordering a Grow Panel, or are a retailer interested in carrying Mellowvision Aquatics products, please email us.